Last edited by An-Gel Sakura on Sun Aug 25, 2013 6:12 am, edited 1 time in total. I'm not really feeling anything ...but I think I'm kind of relieved it's over. All the campaigns and the hoping Mattel would make this character or do that differently...it seemed to have worn us out, no? Yeah I really don't care anymore. I guess I got pretty burned out on the whole thing. I'm not sure I would return even if they went back into production. Then again maybe I just needed a break from the whole thing and the end just coincidentally came at the right time. Who knows... maybe if they returned in a few years I'd return. I'll probably eventually forget any of the bad stuff and only remember the good parts of JLU. Regardless of whatever bad there was I'm just content in the fact that I have them all. No more worries about whether Mattel could get the entire collection in my hands. I'm with you Gel, as always Customs area great way to continue our collections. And in the end, most of the figures I was hoping for were probably not on their way any time soon. After JLU I tried a bit of Marvel Universe, then I tried some Minimates. It's been 8 months of relative peace for me. I really enjoyed it when the line was in production - really enjoyed the hunt, the satisfaction of seeing the collection grow and seeing my display plans of having my JLU stand shoulder to shoulder come to fruition. Love and adore these figures made in Bruce Timm's design style (They still look like mini maquettes to me). And love seeing characters I thought would never see the light of day - namely Lobo, Captain Atom and the Question, made into figures. But the many pains of obtaining them, the money spent and the lack of space to really display any more, really kinda left me burnt out. I'm grateful for the 9 wonderful years we were able to get these great figures from this outstanding series, but all good things must come to end, and it was time. Again, It's been 8 months of peace and I've been thankful for it. I now have the time and money to concentrate on other areas of my collection. I'm really happy now that things have ended, because ideas for my collection I had to sideline due to my focus on completing JLU now have been able to see the light of day. Still, JLU will always have a big place in my heart. And despite the 8 months of peace, JLU has lingered there in the back of my mind. I recently started collecting and binding the DCAU comics. I just finished the Superman Adventures volumes and I'm moving onto the Batman ones. Seems that I can't entirely escape the DCAU, no matter how hard I may try. For now, I'm content to sit in my man cave and look at my complete JLU collection in the display case from across my desk. Fades to black, the Beatles Let It Be plays on the phonograph in my background. Last edited by Krypton1976 on Sun Aug 25, 2013 11:21 am, edited 2 times in total. I still miss it and I buy customs whenever I can. I tried to let DCUC fill the void but I'm now selling off most of those. I gave YJ and MU a chance but they kind of sucked. Action League died too quickly and now I'm pretty much out of toys. I just recently got this all set up though. Miss the Timmverse quite a bit. Don't miss the toys at all. But at least Marvel's starting to world build with the Avengers, Ultimate Spider-man, and Hulk Agents of SMASH. It's not the awesomeness of the Timmverse, but it's fun to see the various cross overs. The main area of the Timmverse that never really got explored was the Titans. How I wish we could have had a couple seasons of Titans: The Animated Series. But seriously, I never did get into DC Classics, but for a short while. It seems that Mattel has priced most of the former fanbase out of collecting them, which in turn sunk the DC ship in terms of making a profit on them. And, if one wanted to sub-up to get figures they did want, they could no longer sell off the ones they didn;t want, due to the high cost after shipping of said figures. It doesn't seem to add up for me that big ol' Mattel can't seem to make DC Classics work any longer. Not when Big H can still make it work. It really does stink for the DC fans. At least, the 'true' DC fans...not that New 52 rubbish. Speaking of which, I totally moved on from JLU(and by extension, Mattel) to Lego. Now, as long as Lego keeps the New 52 crap out of minifigureville, then I'm happy. As for JLU, I'd go back and buy it if Mattel saw fit to produce it. In for a penny, in for a pound. Ironically, even I would probably buy New 52 versions of JLU figures. So, what's left? Kiddie figures of Bats and Supes now? It's like back when Mattel only had the Batman and Superman licenses all over again, only this time they can't utilize the license they do have to it's fullest for whatever reason. Oh, and they were ten/twelve bucks a piece at retail, plus tax. JLU isn't dead, there is still plenty of life in the line. I honestly thought this line would go on forever and with the general direction action figures are taking at the current moment I could see JLU back on store shelves. I mean have you seen the new Star Wars figures ? Every toy line seems to be cutting back on articulation and sculpts. I love the Timmverse and wish we got so many more figures from Luminus to Poison Ivy to Jimmy Olsen and so on but I guess everything must end. 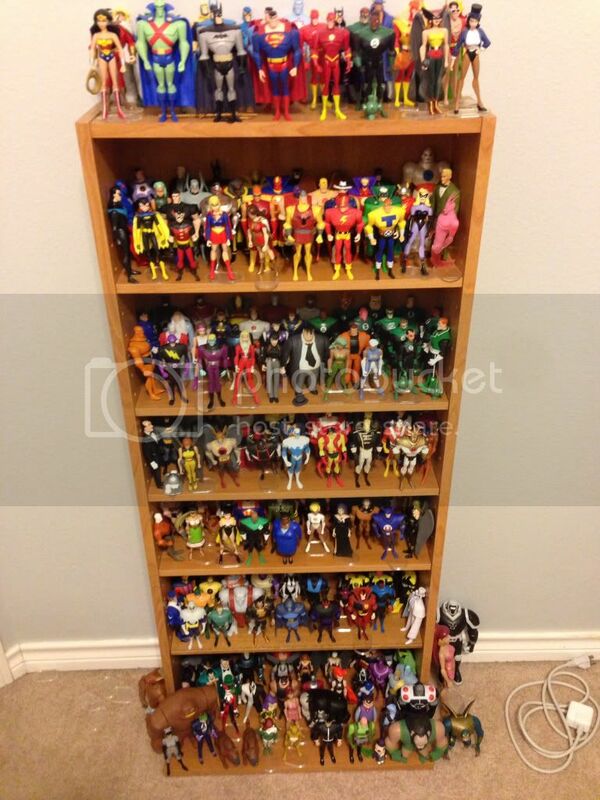 Lots of cool collection pics, and neat customs, in this thread. Nice work everyone. Good thing Shellhead had one more opportunity to let everyone know he doesn't like this toyline (note the title of the thread = "Toyline Discussion"). I would have dug Titans the Animated series. Instead, we got Young Justice, which had no connection to the Timmverse (and not drawn in the Timm style). Being it was a separate universe, I was like....meh. I'll just stick to watching JLU on DVD, thank you very much. Hey there! You good? 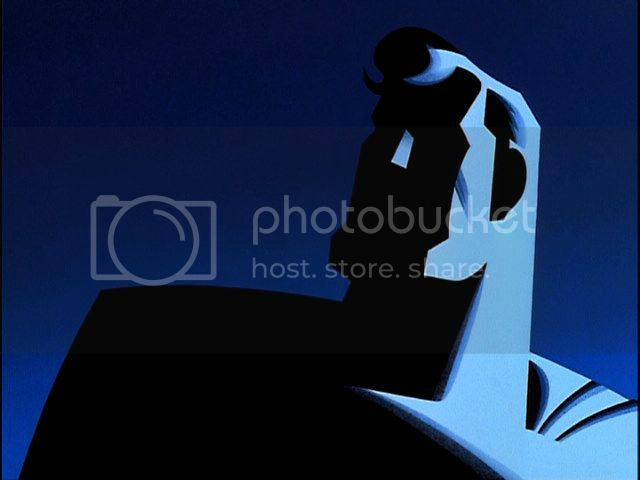 You doing okay?...I thought it would be interesting to hear how folks are doing now that Mattel has stopped producing JLU toys and the DCAU brand is dormant once more. My collecting career started and ended with JLU, although I still peak in here periodically to see the new happenings with DCUC/IE/whatever. Sad to see that line ending for those that collected it. I didn't collect it, but it was cool to see the new reveals and people commenting on them (and it's always good to read a good red Ricky rant). If there is one lesson I hope Matty learned from the demise of the DC brands, it's is don't postpone highly-demanded figures when you don't even know if the line will exist in another six months. I've facepalmed so hard that I gave myself the Iron Claw everytime I hear Mattel talk about spacing out the good figures. I turn my back on you for two seconds, and suddenly you're 80 years old and covered in robots!